The great thing about Matt Bearden’s Punch! show, is that even I can’t ruin it. Oh and how I have tried. Hey jay kay, right? Back on track: Punch!™® is an awesome show. Matt does a great job hosting and booking it and this line-up looks awesome with dudes from LA and Denver on the bill as well. 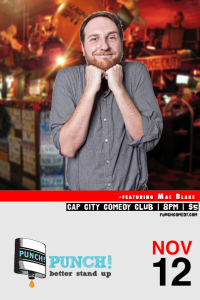 Check it out 8pm, Tuesday Nov 12 at Cap City Comedy Club.